Thurlestone beach is a popular beauty spot consisting of two separate beaches – a smaller one to the north and a larger southern beach. Sat nav users, use the postcode TQ7 3PA. Thurlestone beach is around 8 miles from Salcombe. Leave Salcombe on Salcombe Road/A381, passing through Malborough. 1.5 miles past Malborough, take a left, signposted for South Milton. Continue through the villages of Sutton and South Milton. 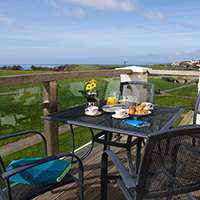 Carry on until you arrive at Thurlestone Golf Club. Take the next right and the car park will appear in front of you. Thurlestone is 17.5 miles from Dartmouth. Take the second right after the roundabout, signposted for Thurlestone. Stay on this narrow road until you arrive at Thurlestone Golf Club. Take the next right and the car park will appear in front of you. The Tally Ho 162 service from Kingsbridge to Hope passes through the villages of South Milton and Thurlestone. Thurlestone beach is a wonderful spot for walking. Take a look at this circular walk that takes in Thurlestone, Hope Cove, South Huish, Galmpton and Bolberry Down. This 3.8 mile walk from Bantham to Thurlestone along the South West Coast Path is another excellent choice. There is one car park at the north beach and another at South Milton Sands. Yes, dogs are welcome throughout the year. If you’d like a beach with more facilities, we advise parking at the South Milton Sands side of the bay. 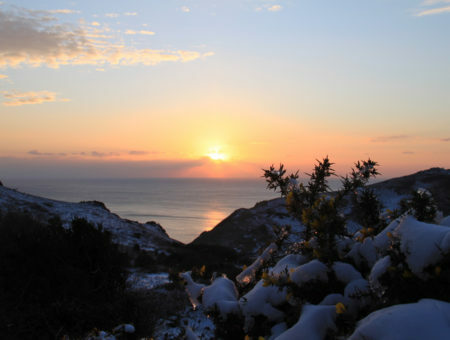 Other popular, spacious beaches with rocky edges include Beesands and Slapton Sands in Start Bay, or you could consider the smaller beaches of Hope Cove which offer excellent facilities nearby. 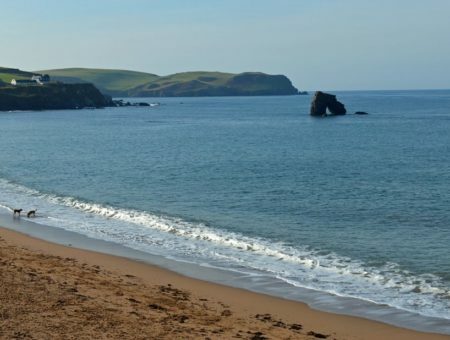 Thurlestone beach is actually made up of two beaches, both formed of coarse sand and shingle. There is a smaller northern cove and a larger one to the south, the latter of which merges into South Milton Sands. While Thurlestone beach has fewer facilities than South Milton Sands, there is a still a lot to enjoy at this hugely popular beauty spot. The coarse sand itself is perfect for all your favourite beach activities, and there are rock pools to explore during low tide, particularly at the southern end of the beach. Seasonal RNLI lifeguards monitor the safety of swimmers and watersports enthusiasts, while the water is rated as excellent (South) and good (North) so it’s nice and safe place to take a dip. But what really makes Thurlestone beach stand out is the iconic Thurlestone Rock, an arch-shaped formation that sits just off the shore. Kayakers like to paddle through it, while those back on the beach enjoy taking photos – it looks particularly striking as the sun sets. 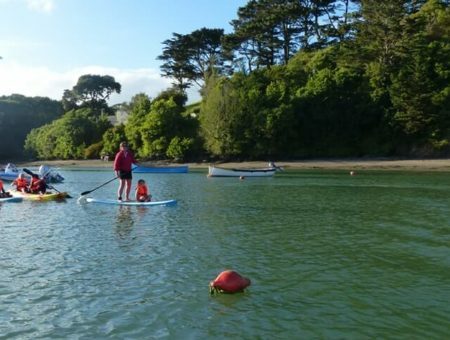 If you are interested in exploring Thurlestone Sands in a kayak or on a stand-up paddleboard, you can hire equipment from Surfin Sam Watersports at the southern edge of the beach (South Milton Sands). Choose from four luxury holiday apartments next to Thurlestone Sands to make the most of this beautiful South Devon beach, the charming village of Thurlestone and the rest of the stunning South Hams region on your next holiday. We hope you enjoyed this article about Thurlestone beach. Our South Devon Beach Bible is the place to come for information about all of the best beaches in the region.